*Appakudatthan, Appala Ranganathan* Posture: Bujanga Sayanam Thirumugamandalam: East. The Lord is seen blessing Upamanyamuni and is also holding a Appa kudam (pot with sweets). Indra Theertham and kollidam river. Thirumazhisai Azhwar(19), Nammazhwar(11), Periazhwar(2), Tirumangai Azhwar (19) Total – 33 pasurams. It is beleived that Nammazhwar attained Moksha at this place as his last compositions was about this place and Lord. The Lord is offered appam (a sweet meat) prasadam daily during Aravanai (Sayanam). The temple is situated on a small hillock. About 5 kms from Anbil across the Kollidam river. About 10 kms from Lalgudi and about 23 kms from Trichy by road. Can be approached from Kumbakonam via Tiruvaiyaru, Tirukkattupalli, Anicut road. 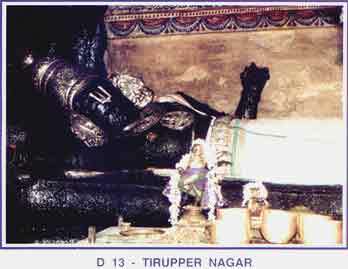 Tirupper Nagar is an old name and the place is commonly known as Koviladi ( as the bus stops at the foot of the temple).